Are you running your business or is your business running you? Is your business as successful as you want it to be? 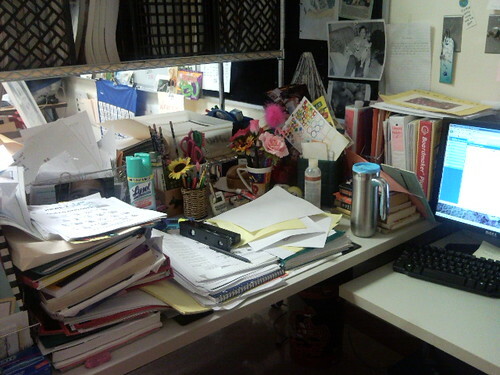 Does your desk look something like this? Many of our entrepreneur clients come to us because they’re stuck with their business. Some find that their companies have grown past their ability to manage them. Others find that their business is consuming their life. And, some created a job for themselves, not a business, and now that they are past their initial clients, the marketing and sales pipeline is dry. Vivid Epiphany™ supports business owners to create the right balance in work as well as in life. Our small business program identifies strengths and weaknesses in your business plan. Our coaches have experience starting up and running their own businesses, so they understand, first hand, what it takes to be a successful entrepreneur. Leveraging the expansive expertise of our coaching team, you will find the support you need to reach your goals. Our clients can be in any stage from start up, growth, to mature. Whatever your situation, we will customize your Entrepreneurial Engagement to meet your goals and your needs. Call 972.599.2642 today to schedule your complimentary initial consultation.